LINK: Did pitchFX Destroy Baseball? 1) Starting in 2006 stringent drug testing reduced the use of PEDs in the game. 2) Starting in 2006, the introduction of the pitchFX system increased the size of the strike zone, most notably by expanding the low part downward. Follow the link for more about pitchFX, a video and computer sensor system that tracks the speed and trajectory of every major league pitch. It’s an interesting piece, especially the chart that shows how much better the umpires have gotten since their work could be not only reviewed, but reviewed against real objective data (not that it is always perfect). As someone who, perhaps naively, argued in the early days of the homer boom that it looked to me like the real cause was a flattening strike zone, which meant hitters could look inside or outside and not so much up and down, the data strongly suggests this is at least partially true. One researcher says that the decline in homers since 2006 is 40 percent due to changes in the strike zone. That’s a lot, and could be true, but I suspect we haven’t heard the last of this. At the end of his piece ThompsonÂ lists other causes for a drop in offensive power, including defense (though this shouldn’t have much of an impact on homer rates) and changes in the baseball, but when he tries to remind us all of the shadow of PEDs use on this issue, he falters. Perhaps mostÂ importantly, the harsh 2006 rules againstÂ performance-enhancing drugsÂ offer a compelling explanation for baseball’s dearth of powerâ€”although it’s odd that baseball’s minor leagues haven’t seen a similar decline in offensive performance since their own steroid policy was implemented. The minor league drug policy is in many ways more stringent than the major league program. What the minor leagues don’t have is pitchFX and the absolutely best umpires. Oh, and to answer the question in the headline: pitchFX didn’t destroy baseball, it simply made the administration of the game more accurate and fair. In the American Dream League, which is an ancient 4×4 AL only rotisserie league, a player who is dealt to an NL team is lost to it’s ADL owner. Stats no longer accrue, he becomes a sudden bad memory, and a daily irritant, since the ADL owner may keep him on his reserve list, and where his production is posted daily accompanied by the notation (N.L.). Because we are approaching the month of July, and what we used to call the inter league trading deadline is looming, my thoughts turn to David Price. Price is one of the best pitchers in the game, and has had an excellent if star-crossed first half. His Ratio is lower than his career Ratio, his strikeout rate is higher and his walk rate is lower than his career rates (he’s walked just 14 in 124 IP), yet his ERA is the highest of his career. Why? He’s allowed quite a few homers, and his BABIP is outrageous, partly because the Tampa defense hasn’t been as efficient as in the past, but also because he’s been wicked unlucky. With all of that he’s earned $11 in the first half in 4×4, according to Alex Patton, and is on pace to earn $22. The important thing about that, however, is that he could earn much more than that if some of the bad breaks go his way in the second half. Alas, we have a rule in the American Dream League that a player traded to the National League is dead to us, and David Price is the player most likely to traded this year before the July 31st deadline. Now, he may not be traded to the National League. There are AL teams in the running for his services, too, but that drop dead rule means he’s about a 50/50 chance to be either the excellent pitcher David Price for an ADL team or null and void. My team is in the running for the Lukas Cup this year, currently in second place, and is strong enough that I might be able to stay in contention without Price, but it occurs to me that it might make sense to flip him at this point and get half a pig rather than a poke. Please feel free to make an offer. I’m not really in the market for speed or batting average, in fact I might package some of either or both for a nice power upgrade. I would also consider trading a potential keeper next year, if the price is right. My ideal candidate is a power-hitting catcher, for what that’s worth. Thanks for reading along, and for your cleverest offers.And enjoy this lovely weekend. So far the letter has elicited a few offers of decent hitting catchers, which tells me I shouldn’t have used that example, and a gag offer of Vidal Nuno, who I was disappointed I didn’t land in the auction. His market price was $30, which included a little discount for the possibility he would be traded. But let’s say he’s a $30 pitcher (since there was also some draft inflation in our keeper league). Half a season is worth $15. Because he has a 50/50 chance of being traded out of the league, his worth is actually $7.50. But because he actually probably has a month of playing time left in the AL, worth $5, his actual value is somewhere between $7.50 (if he were to be traded today) and $12.50 (if he were to be traded on July 31). Because I probably just lost Josh Reddick to the DL, I have a hole in the outfield, so I’m looking for an outfielder who cost $25 more than Endy Chavez on auction day, or a catcher who cost $20 more than Carlos Corporan. One interesting aspect to the ADLÂ this year is our standings, which have bifurcated. There are seven teams between 71 and 56 points, and five teams between 40 and 32. A team that finishes with fewer than 35 points is penalized $1 of our $50 FAAB the next year for each point lower than 35 he finishes. Plus, teams that finish 10-12 have fewer keeper slots the next year. So there’s a lot of incentive for one of the cellar dwellars to make a big play to climb out on David Price’s arm. Â If he were to stay in the AL the rest of this summer, he’ll be a terrific bargain and give a down team a big edge. And might even turn out to be a keeper next year, too, if he signs a long-term deal. I’ll let you know how things work out. ASK ROTOMAN: What is FAAB Worth? I was thinking about redeeming the DLed Nate Jones in Tout Wars AL, which got me thinking about FAAB, Vickrey bidding and being in last place a few weeks after the season starts. I wrote about it here at USA Today. Does it make sense to add Jones’ $14 now? Or should I wait to see if he can get healthy and reclaim the closer job in Chicago? I had some thoughts about your recent column and thought they made a better topic here than at your various discussion boards. Though perhaps I’ll show up at those, too. You raise a few interesting issues that I wanted to touch on. I will admit that I thought the Tout Wars redemption process was going to be a disaster. It has instead been a great success. (I thought the same about FAAB trading as well, and was wrong about that, too.) In Tout Wars teams are allowed to cut any player on the DL and reclaim their draft day price as FAAB up until the All Star breakâ€”after which they can reclaim half their draft day price as FAAB. The Â usual dynamic for redemption is determining how long a player will be out, versus his utility when/if he returns, filtered by the value of the added FAAB. This means that guys who are out for a while, but who may not be out all season, can reside on a team’s unlimited DL reserve until it becomes clear that the extra FAAB is going to matter (as we approach the break, and the interleague trading deadline). What makes Nate Jones interesting is that he could return to the bullpen eventually and not gain the closing job, which would pretty much waste his $14. That’s a good reason to cut him and reclaim his bid price, though at this point he’s not close to returning, and it is pretty unlikely that the $14 you add to your FAAB total will have any utility at all until much later in the season. For those reasons, I suggest waiting until he’s either done for the year, close to returning as a non-closer, or you need the $14 to buy something better. As for Vickrey, the bidding auction system that we use in Tout Wars, it awards the FAAB player to the highest bidder, but reduces their cost to $1 more than the second highest bidder.Â Cory Schwartz was quoted earlier this week about how he thinks Vickrey just randomizes the process, and he doesn’t like it, but his bidding last week in Tout Mixed Auction is a prime example of Vickrey’s importance and why you and I like it. As we all know, there were some closers available in last week’s bidding. Cory decided he needed one of them. Zach Steinhorn agreed with Cory that the best available closer was Francisco Rodriguez. Zach bid an aggressive $33, but Cory trumped him by bidding $60, which was then reduced a la Vickrey to $34. One can look at this as Cory “saving” $26, but it is a fairer evaluation of Vickrey to say that Cory bid aggressively because he wanted K-Rod most. Such overbids are made knowing that someone else who did the same thing would raise the price of K-Rod a lot, but that was a price Cory was willing to pay. The stated intention of Vickrey auctions are to limit system rigging, since bidders are encouraged to bid the absolute most they’re willing to pay (knowing that if they value more than the market they won’t have to pay their full price). Cory bid what he was willing to pay, and since no one else would pay as much, he ended up with a discount, as it were. That’s a feature, not a bug. Where Vickrey excels is when there are a number of bidders. Where Vickrey falters is on the players for whom there is a limited market. With only 12 or 15 teams in a league, many without holes at particular positions, there may only be one or two teams looking for a player at a particular position. There may only be one or two of those players at that position available. One of those teams may value one of those players a lot, but chances are, even if he bids aggressively, his bid will be reduced to $1 or a few dollars because there was no market for that player. That seems to me to distort the bidding process. For a couple years we played in Tout Wars with a $10 floor on bidding. If you bid $10 or less, that was the price you would pay if you won, with no reductions. If you bid $10 or more and no one else bid more than $10, your winning bid would be reduced to $10. If two bids exceeded $10 the standard Vickrey rules applied. The idea was to increase the cost of roster churning at the low end, where the market is less than robust. Many objected to this, saying they thought that if we were going to play with Vickrey we should play pure Vickrey. After a rule change, that’s the way we play now, and while I still think it makes the low-level bidding somewhat arbitrary, it isn’t really a problem. I recommend Vickrey bidding for the most contested players, but the use of a floor for the cheap bidding. That’s the best balance in my opinion. Okay, back to FAAB and inseason values. One rule that might help us find the balance between Draft Day dollars and FAAB dollars would be to combine the two. Let’s say teams are given $360 on auction day, and are told that they can spend as much of that as they like, with the balance ending up as their available FAAB balance. How much would they actually spend on Draft Day? Or, less radically, you’re restricted to the $260 for your regular team, but then can bid FAAB $ for the reserve rounds. By increasing the porousness between Draft Dollars and FAAB budgets, we open up ways for teams to play different strategies at the draft table, in the reserve rounds and all season long during waivers and claims. Earlier this year I looked at how many stats were available via FAAB and claims in the NL and Mixed Leagues. This is what our money goes to buy on draft day versus what we’re able to add as the season progresses. Would that number change if we spent more cash on draft day and had less available for inseason buys? It sure looks to me that paying more on draft day is the way to go. ASK ROTOMAN: Do We Value Relief Too Much? -Roster spots for all positions + 2 DH + 1 extra infielder & outfield. 5 starting pitcher spots + 3 relief pitcher spots. I think our issue arises from the 3 RP spots. With 12 teams, there are not enough ‘starting closers’ to cover this position and our draft showed this with many people loading up on closers in round 5-8. I also think our 8 start-limit is too low and limits the value of quality starting pitching. My thought is if we increased the start limit to 10 or 12, it would even out the people hoarding closers vs the people with depth at starting pitcher. Or would dropping relievers from 3 spots to 2 be better? Any thoughts are much appreciated, thank you!! Limiting the number of starts per week to a low number means that you’re effectively taking IP off the table. Starters on good teams gain value, as do those with high strikeout rates, since you’re turning the K category into a ratio, like K/9. If you have daily ups and downs, maybe there is a reason to limit starts, but it should be fairly high, so that teams can choose to run up the innings OR protect their ERA and Ratio as a way to gain points. Another good reason to have a Starts limit is because of the S/R designation, which often makes a mockery of fantasy pitching staff balance. But since you’re complaining about the relievers having too much value, something else is going on in your league, and I’m not sure what it is. Limiting teams to three relievers, when there are only 32 closers, seems like a red herring. Too many teams right now have no closer, or multiple arms to feed save ops. Sure, the best relievers might go early, but isn’t figuring out when to jump there Â a key part of the game? And I’m not sure the guy who went early for Craig Kimbrel is feeling that good right now. For me, any set of rules can take a few years to gel. Maybe teams thought something would happen this year, drafted accordingly, and they’re now learning that it didn’t, and so the team that marched to a different drum will win in the end. You have to decide if that’s a good or bad thing. I’m personally in favor of as few rules as possible that describe how the game has to be played. Multiple strategic approaches makes for a more fun and challenging game. So maybe don’t cap starts or innings, but cap the number of decisions a team can have (162 wins + losses, for instance). When a team reaches that number it no longer accrues pitching stats. Or broaden categories, so that relievers count for saves and holds, instead of just saves. I recommend half-holds + saves as a category, giving value to middle relievers while recognizing that the role of closer has a value unto itself. The thing to recognize is that the shallower the mixed league, the less the fantasy league is likely to look like real baseball and the more it’s going to become something else. Whatever that is is just fine, if it pleases you and your leaguemates, but my advice if you’re looking for fix things is to make the rules expansive and encourage creative play rather than trying to stick everyone in some restrictive box. Hope the end of this bit comes as a relief. Mastersball.com’s Lawr Michaels tackles on-base percentage, as Tout Wars’ AL and NL leagues transition to the greatest stat ever! Um, to a better stat than Batting Average. Read it here. ASK ROTOMAN: My League Is Using New Categories. Help! My 5×5 Rotisserrie – 10 team NL-Only Yahoo League is switching categories this year: Â New Categories are XBH, OBP and E, replacing HR, BA & SB to go with RBI and R for five categories. Â In pitching we are keeping W, Sv, ERA & Whip and replacing K with K/BB. Â How do I project what I will need in categories without a previous history of scoring? Valuing stats is easy. Knowing how many you’ll need to win isn’t, but isn’t necessary unless your league doesn’t allow you to trade. And even then you’ll be better off knowing how much each player is worth than targeting category totals. Your goal is to amass value, which means buying stats that others are undervaluing. Targeting category totals too often leads to teams overbidding to reach their goals. Obviously, there is a point when too much is too much, when you have way more steals or saves than you can gain points for in roto scoring, but common sense should be enough to guide you there. In the meantime, collect value. The problem for your league is that some of your changes are provocative and disrupt the way we usually play the game. Not XBH, which is just like HR, only it rewards Doubles and Triples hitters. And not OBP, which is just like BA, but rewards guys who take a walk. But Errors? Hell yes. Errors is a backward category. The lower the number, the better. The problem is that fielders make errors not only in proportion to how many they make, but by how much they play. The more they play, the more errors they make. More playing time has long been a key strategy for 5×5 roto. You want to win the AB race, even though AB isn’t a category, because the more AB your team puts up the more Runs and RBI and HR it will accrue. So, if we look at the top 15 NL shortstops last year in fewest Errors allowed (200 AB minimum), they averaged 621 innings played and 7 errors (84 innings per error), while the top 15 NL shortstop last year in Offensive contribution (not including steals, which you’re replacing), averaged 990 inning played and 12 errors (83 innings per error). As you can see, there’s almost no difference in quality as a group, but the heavier offensive contributors play more and hurt more in your Error category. While there are clear winners (Troy Tulowitzki, maybe Jose Iglesias) and losers (Jonathan Villar! Dee Gordon! ), it isn’t clear to me how you go about choosing whether to roster Brandon Crawford, good defender but makes errors because he plays a lot and is a marginal offensive talent, or Daniel Descalso, who played much less, contributed less offensively, but hardly made half as many errors. And since the player pool determines the value of players, every change to the pool has the potential to shift all the prices. Fascinating stuff. And good luck with it. Converting from Strikeouts to Strikeouts Divided By Bases on Balls is a whole ‘nother matter. Here you’re switching from a quantitative stat that measures playing time almost as much as quality, there are many leagues that play with IP as their fifth 5×5 category rather than strikeouts. Put this together with ERA and WHIP, also qualitative stats, and you’re almost begging for teams to try pare their innings pitched to a minimum. Remember that no starters earn Saves, and few closers rank highly in Wins, so you’re basically measuring pitchers on their quality innings. I’m a bit skeptical about this innovation being a good idea, but if you have a stringent minimum IP limit it might work. Still, if you’re playing with real Yahoo rosters, guys who qualify as SP but work in relief are going to be gold. To get back to your question. In standard roto leagues, a good benchmark for last place in the qualitative categories is the major league average. Players who do better than that are some roto help. In your somewhat smaller league the right number is going to be better. To figure out K/BB I recommend sorting last year’s stats based on different IP threshholds. With a minimum IP of 40 last year, 22 of the Top 30 pitchers in K/BB were relievers. Tout Wars, you may have heard, is moving it’s Mixed Leagues to On Base Percentage this year, rather than that old standby category Batting Average. The reason, as described here, is because OBP measures a player’s ability to draw walks, which is a valuable baseball skill that the traditional fantasy stats undervalue. My first response was fear that this was true. That the guys whose value would jump most were already valuable guys. That wasn’t why we’d changed the rule. But the fact is that some players in every strata of the game, from homer hitters to speed merchants, show an ability to walk, while others with those same talents don’t show that ability. The adoption of the OBP rule was intended to value home run hitters who walked more than home run hitters who didn’t walk. It was intended to value stolen base guys who walked more than those who didn’t walk. It was intended to value guys who hit for a high average who walked more than those who hit for high average who didn’t. The bottom line was, walks are a valuable skill that fantasy baseball has valued only peripherally, and as I noted here the other day in the Derek Carty is Absolutely Right post: By giving up an at-bat when taking a walk, a player hurts his fantasy value overall while often improving his real baseball team. Guys who walk get fewer chances to homer, fewer changes to drive in runs, and can even end up with a low batting average while their high on base percentage helps their team win games. There are a few sluggers on that list, many guys who hit home runs, but certainly not only the best home run hitters. Many of these are guys whose baseball creds are mocked by fantasy players, because they don’t hit for big power and have bad batting averages. Why do they even have jobs, the neophyte wonders? Because getting on base is a valued skill. It has real value that fantasy leagues that don’t use OBP aren’t capturing. It’s also a skill that a player like Joey Votto has when his power deserts him because of injury. It’s true, not as many sluggers here. And a lot of marginal offensive talents, or special talents (Ichiro) whose ability to hit for BA while not taking bases on balls should be noted, not applauded, by fantasy players. Welcome OBP! Derek Carty is Absolutely Right! Except that he’s wrong. 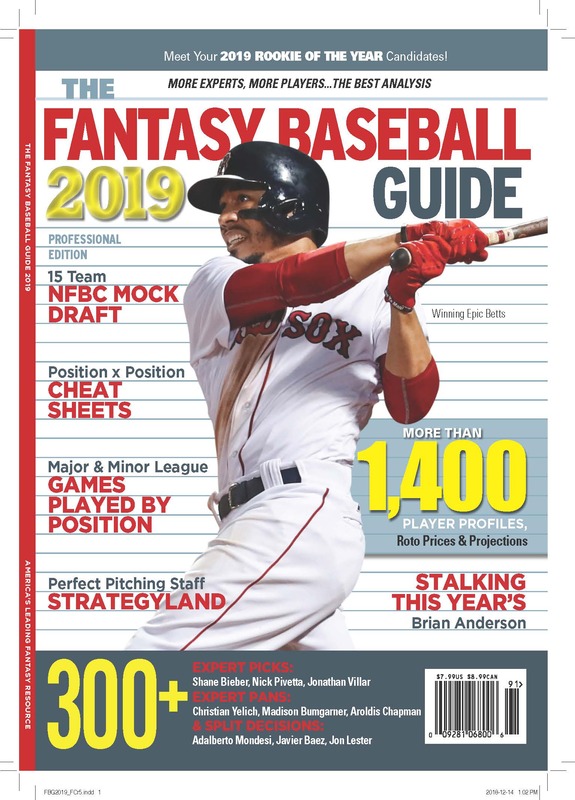 Todd Zola ran a Roundtable I participated in over at KFFL this week, about Tout Wars move to on base percentage instead of batting average as a category in the Mixed league this year. The support of the merry knights was fairly strong, which surprised me. We decided to ease into OBP in mixed only because we’d disrupted the AL and NL leagues last year introducing the Swingman. Now, Derek Carty has laid out an argument against using OBP, at his blog. I agree with him 110 percent that the object of the fantasy game is not to mimic the real game. The fantasy game is derivative of a real world game, but it has it’s own very distinct rules and strategies and calls on totally different skills to play. For me this is a major point of the thing. When I was young I played baseball on the diamond. If I wanted to keep playing that game I’d play it, or a computer version of it. To my mind the genius of the fantasy game was the establishment of eight categories that collect data about the skills and roles of players, allowing one to create a great or crappy team based on one’s ability to collect the categories efficiently. I begrudge the move to ten cats, we don’t really need more than that, and I have no desire to play with more (though many people do). 1) Taking a walk is a fundamental skill, and the only ways the original roto categories valued walks was in runs scored (guys on base more score more) and stolen base opportunities. So, walks weren’t nothing, but they weren’t much either. OBP gives real value to hitters whose game involves getting on base more, at the expense of less-talented hitters who don’t take walks. 2) When fantasy leagues use BA as a category, a player who takes a walk can help his major league team and hurt his minor league team. Every BB in standard roto is a miss, a lost chance to get a hit or (usually) drive in a run or hit a home run. In standard fantasy, if you draft a team of guys who walk a lot you’ll lose the at-bats race, and often (though not necessarily) lag in the counting categories. Shouldn’t fantasy value the better hitter more if it can? I think OBP is an obvious improvement over BA, and maybe the knights of the roundtable did too because many of them have played in the XFL, which adopted OBP 11 seasons ago. The differences aren’t huge, but suddenly the .255 hitter with a .380 OBP becomes the stud he is in real life and it feels right. That’s the way it should be. I am in AL only auction leagues. We use the $260 salary cap for a 5×5 league with 9 pitchers and 14 hitters. With the Houston Astros coming the AL, I am wonder what changes you might suggest. Do we add one more pitcher? Add another DH? How do we handle the minimum IP and AB requirements? Thanks for your thoughtful response. Adding the Astros to the American League means that there will be about 5,500 more at bats available for a 12 team AL only fantasy league, and about 1,425 additional innings. This is a lot. These at bats and innings pitched dilute the pool by about 15 percent, so it’s going to make a difference. But how much of one? A different way to look at it is to consider that the AL is adding one regular catcher, one regular first baseman, one regular second baseman, etc. etc. I’ll stop, I think you get the point. So the practical difference is that instead of 12 roto teams selecting 24 catchers out of a pool of (roughly) 28 AL catchers, the roto teams are taking 28 catchers out of a pool of 30. Two catchers don’t make the cut and are part of six undrafted catchers, rather than four. Since these two additions to the free agent pool are the worst available players, the total difference on your game will be negligible. The same is true at every position. The number of quality players goes up a little, the amount of available stats goes up 15 percent, the improvement in the replacement pool is very small. What rules changes should you make because of this? I think it’s a fair guess that if you don’t make any changes to your game it will be fine. You will have some additional players in the free agent pool, at least at the start of the season, but depending on your reserve rules I doubt this will make much difference (or that they’ll stay in the pool if they’re any help at all). The increase in available stats will make it easier for teams to get to the minimum at bats and innings pitched. You don’t say what level you have for these, but in a 5×5 league they should be pretty irrelevant. The only reason to have them is to keep teams that are suffering from bad luck from desperately adopting a Sweeny-type plan on the fly during the season. It should be every team’s goal in 5×5 to collect as many AB and IP as possible, so raise these minimums if you think it might help, but it probably isn’t necessary. In terms of roster configuration, I can report that in the American Dream League (AL, 4×4) last year we added a 10th pitcher as an experiment, and I don’t think anyone thought it made the game much better or much worse. It was fine. There’s every reason to go that way this year, but you probably won’t notice much of a difference. In Tout Wars last year, we converted the fifth OF to a Swingman, essentially a second DH or a Pitcher. Team managers liked having the option to play a 10th pitcher when there wasn’t a worthwhile hitter available in the FA pool. There aren’t many leagues playing with this rule yet, but I think it’s a very natural progression. One alternative in your league might be to continue to roster five outfielders, and add a Utility Swingman, who could qualify at any position or be a pitcher, increasing your overall roster from 23 to 24 players. I’m sure that would work, but I’m equally sure that if you do nothing no catastrophe will ensue. Uh oh. Here we go again. Not necessarily the game, but 1-0 is a lot different than 3-0. Using replays (or replay challenges) on plays like this Robinson Cano tag on Omar Infante in the second game of the ALCS between the Tigers and the Yankees seems like a no brainer. Why won’t MLB do it? I keep thinking that there must be more complicated game situations that would be further complicated if an umpire’s ruling in the first part of a play were to be overturned. I bet there are some of those. But I bet we can deal with them. ML rules have pages and pages and pages of examples of situations and rules interpretations, meant to interpret the rules in a practical way. One of the reasons we love the game is because every day we see something we’ve never seen before. The thing we should never see again is an obviously botched call stand when the replay is irrefutable. Let’s argue about how all those contingent events should be handled. That won’t be easy. But getting the calls right, when the video is clear, should be.